Say Goodbye to Knobs, Pots, and Hundreds of Different Timers! 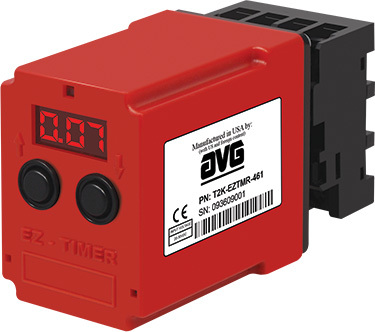 EZ Timer, all digital programmable timers offer flexible features at a great price. The large, bright red LED display has a 12 mm character display height. No knobs, only digital settings to 1% resolution, 1% absolute accuracy and 0.1% repeat accuracy, so operation is easy. Widest Time delay ranges from 0.01 sec to 999 hrs. Password protection/security is available to avoid tampering with the settings. This type of operation indicates that the timer delay (SP) begins as soon as the input power at operating voltage (V) is supplied. The Relay (R) output is energized only at the end of the time delay and then it remains energized as long as input power is supplied. The timer and the Relay output are Reset on loss of power. Input Power (V) must be applied to the timer before and during timing. Being Positive edge-triggered, the Relay (R) output is energized upon momentary or maintained closure of the switch (S1). The energized Relay also triggers the time delay (SP). When the timer finishes timing, the Relay de-energizes. Input Power (V) must be applied to the timer before and during timing. When the switch (S1) is closed, the Relay (R) output is energized. The time delay begins when the switch is opened (Negative edge triggered) and the output remains energized during timing. The output is de-energized at the end of the time delay. When input power is applied at startup, the Relay output is energized and the TON timer begins. At the end of the TON time, the output de-energizes and the TOF time begins. At the end of the TOF time, the output is re-energized and the cycle repeats as long as power is applied. 10 different timer modes, including delay on make, delay on break, single shot, cycle, interval, retriggerable single shot, trailing single shot, inverted single shot, inverted delay on break, and accumulative delay on make. ©2016 Uticor. All rights reserved. All Product names, trademarks and registered trademarks are the property of their respective manufacturers or legal holders. Uticor disclaims any proprietary interest in the marks or names of others.